Tonight I felt a primal urge to grill up a giant piece of meat and eat it off the bone. I'm not sure why. I'm not really that macho kind of guy. I enjoy drinking tea and listening to classical music. I've also been known to watch shows about vampires of my own free will. That being said, there was something summoning me to do this and I had to obey. I was able to get my hands on a beautiful bone-in ribeye cut off the first bone. I fired up the grill and seared it on both sides until it was charred and crispy but still beautifully juicy on the inside. With each bite I found myself turning more into an animal until finally I was gripping the small end bone and sucking on it like it was a pacifier. It is probably one of the top five best steaks I've ever had. 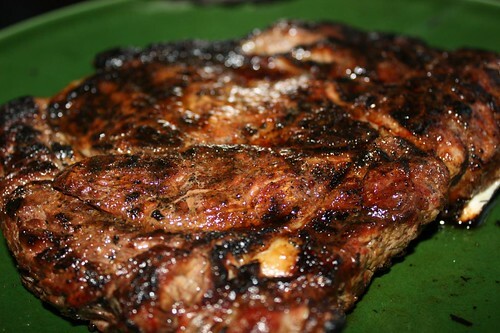 The best is still a dry aged sirloin that Jen made for us in 2004 or 2005. Sometimes I still dream about that. 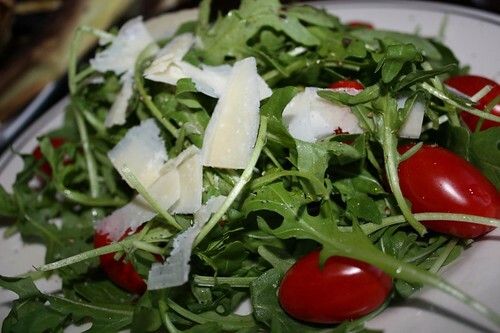 I also grilled a few ears of corn to go with it and made a salad of arugula, lemon, Parmigiano-Reggiano, and grape tomatoes. 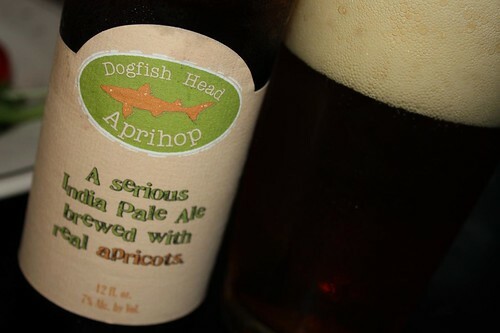 As an accompaniment I had a Dogfish Head Aprihop Beer which combines something I hate with something my father-in-law hates. That is to say IPA and fruit in beer. 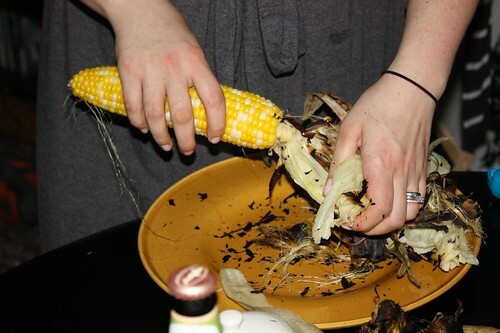 It may have been the grilled meat and corn but I didn't really detect any noticeable apricot taste. Overall it was pretty good, though darker than I expected. I just can't help but feel, whilst drinking Dogfish Head beer, that the label looks like it was printed on an inkjet printer in someone's basement. Nothing against the beer, of course, I just find the label to do very DIY. For that reason it was probably the most appropriate beverage accompaniment to this DIY meal. If there was nothing written on the label you would never even know there was fruit in it.